We are a mobile games developer. We are incredibly successful. We make, in total, 25 million customers smile. Day by day, night by night. This is what we do – this is what makes us proud & happy. This is what keeps us excelling on and on and on. Measurement of success is nothing without proper context. According to analytics specialist Appannie, we have been listed as the most successful app company in Austria. We are Number 8 in Europe (from a total of ~500.000 European app producers) and, what really makes us stand out: Worldwide, we were listed on position 48. From a total of several million competitors. To continue this incredible success, we continuously enlarge our portfolio in the social casino & casual game market and grow the company at a healthy pace. Cervo Media GmbH, located in the heart of Europe, is one of Austria’s most innovative and successful new media companies. Officially founded on January 1st, 2009, as Cervo e.U., its premium productions quickly became famous for their fresh approach, high aesthetic standards and excellent usability. Besides the extremely successful iPhone application ViDICTO+, which was acquired by a large U.S. publisher in 2010, Cervo Media has created games and applications for customers like Lundbeck Austria, the Austrian national television station ORF or Fresh Games LLC. In 2011, our casual game Crazy Rings (formerly known as Riot Rings) stormed the app charts and won several prizes and nominations. David Jaffe, creator of God of War and Twisted Metal called the app one of the best 10 games in 2011. This was also our first multi-plattform title. Crazy Rings was released on iOS, Android, PC and Mac. 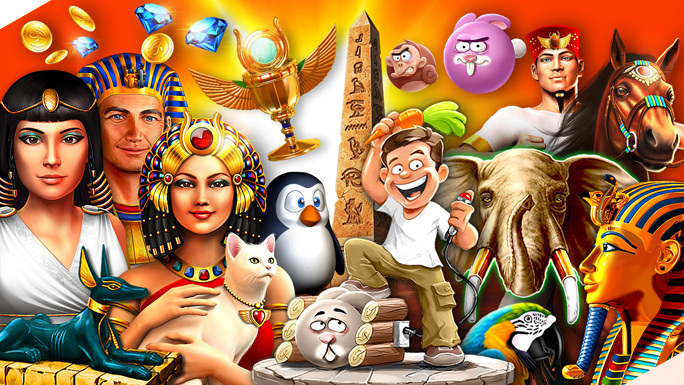 In 2012, our Casino app Pharaoh’s Way set new records and catapulted the company to new heights. The app is continuously found in the Top 10 overall iOS apps of all big key markets – competing with competitors like Zynga or Electronic Arts. As a result of this success, external productions had to be completely stopped to focus on interal productions. In December 2012, Greentube IES and Cervo Media formed a strategic partnership and Greentube became Cervo Media’s parent organization. With our combined forces we represent the most progressive major force in Europe’s gaming app landscape. Join us on our amazing journey and contact us today! Click here to view the imprint. Click here to see open job postings. Click here to learn more about Greentube IES.